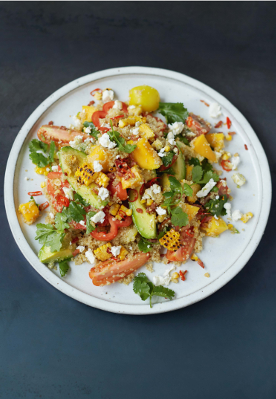 Giving us two of our five-a-day, this colourful salad also uses quinoa – it’s a brilliant, tasty grain packed with both protein and fibre, and is also gluten-free. 1. Cook the quinoa according to the packet instructions, then drain. Peel and destone the mango and avocado, then roughly chop or slice the flesh, along with the tomatoes. In a large bowl, toss them with the lime zest and juice, 2 tablespoons of extra virgin olive oil and a pinch of sea salt and black pepper. Leave to macerate while you grill the corn cobs on a hot griddle pan until nicely charred, then carefully slice off the kernels. 2. Peel the garlic and finely slice with the bacon and chilli (deseed if you like). Put it all into a small frying pan on a medium heat with 1 teaspoon of olive oil. Stir and cook until lightly golden, tossing regularly. Tip into the bowl of macerated veg, add the quinoa and corn and toss it all together, then taste and season to perfection. Divide between your plates, crumble over the feta, pick over the herb leaves and serve. Recipe taken from Everyday Super Food by Jamie Oliver, published by Penguin Random House. © Jamie Oliver Enterprises Limited (2015 Everyday Super Food) Photographer: Jamie Oliver.